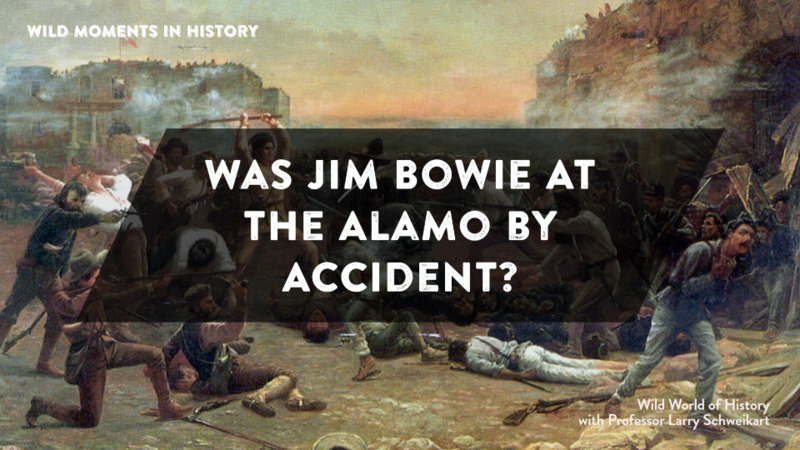 Was Jim Bowie At the Alamo by Accident? Did you know that Jim Bowie, creator of the Bowie knife and one of the valiant heroes of the Alamo, was in Texas partly because he was involved in a court case over a land speculation deal in Louisiana? Since the 1820s, Jim and his other brother, John, fought a long court case over claims he had in Louisiana. In May 1824, Congress instructed the superior court in Louisiana to hear suits from claimants, which included 126 people who said they bought land from the Bowies but hadn’t received them. The superior court upheld most of the claims, only to have the decisions reversed in 1831 when new documentation showed that the Bowies never owned the land at all, and that the original grant had been forged. When the claimants sought to sue the Bowies for delivery of the grants, the court documents mysteriously disappeared, and they were left without claims. In the meantime, Jim Bowie had been involved in the Sandbar Fight, wherein he was engaged in a long feud with Norris Wright, a sheriff in Louisiana. Bowie and Wright both attended a duel as seconds, but other supporters of each party showed up. Although the duelists each fired and missed—the shook hands and agreed to depart—others were not so forgiving. A fight broke out in which Bowie was shot in the hip, drew a butcher knife he carried, but was stabbed by a sword-cane by his opponent. With the sword still in him, Bowie grabbed his enemy and fatally stabbed him—but Bowie was shot again and stabbed again before the fight ended. Fortunately for Bowie, a doctor was present and he removed the bullets. Whether Jim or Rezin actually improved on the butcher knife and turned it into the famous Bowie Knife is not clear, but Jim was never without it after that. Between the land issues and the enemies he made, Jim Bowie left for Texas in 1828. He settled there as friction developed between the Texans, who wanted to abide by the Constitution of 1824 that permitted slavery, and the Mexican government under Antonio Lopez de Santa Anna. At the Battle of Concepcion, Bowie led a charge that nabbed one of the two Mexican cannons and forced the Mexican forces from the field. Then, hearing that Santa Anna was marching on San Antonio, Bowie led 30 men to the Alamo where he joined another two hundred and twenty-seven men. Outnumbered at least six-to-one, Bowie and the defenders of the Alamo killed or wounded one-third of Santa Anna’s army before being overwhelmed.